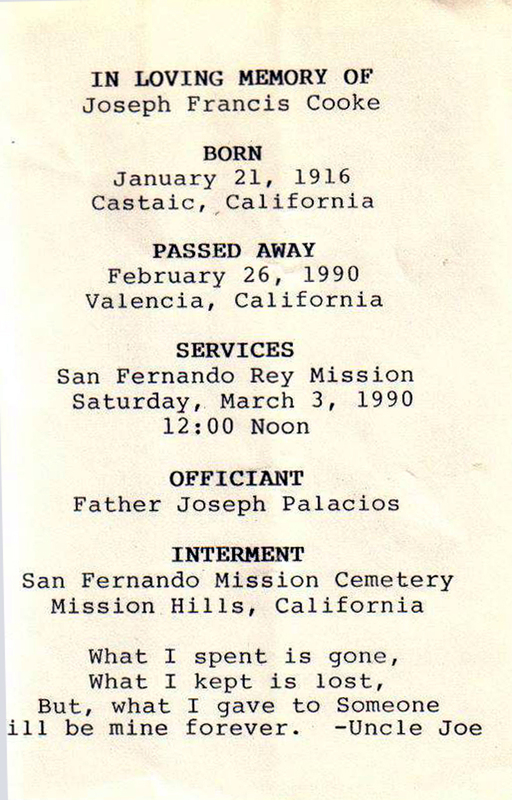 Page from memorial service program for Joseph Francis "Joe" Cooke, March 3, 1990. Joe is a son of Fred and Chief Frances Cooke. Both parents are of California Indian ancestry; his mother's lineage is traceable to individuals who lived at Chaguayabit (aka Tsawayung), a Tataviam Indian village at Castaic Junction, prior to European contact in 1769. FF9001: 19200 dpi jpeg from smaller jpeg courtesy of Renee Cano | Online image only.